Hi, I'm Megan the runner, not the foodie. Remember me? As I sit here and scroll through my blog, I have to sit back and laugh at it over the past two weeks. Ever since returning from New Orleans, all I have talked about was food. I had to take a moment to apologize to any of my readers who are following me for running vs. me posting about food every single day. With that said, I will apologize again in advance - it is Spring menu debut time and my blog will be drowning in delicious bites and drinks over the next few weeks. I promise to keep it as equal with food and running over the next few weeks. While I am thrilled for the medal, my body isn't too excited. I injured my left foot, when,why and where is unknown. I didn't notice it until I laced my sneakers up the other day. It's a sharp pain in the center of the top of my foot. If that isn't enough, I went with my Mom and Gabe's Mom for a pedicure yesterday. The lady who did my pedi didn't speak much English. She kept telling me I had a fungus on my big toe. I told her 10+ times that it was a bruise from running, not a fungus. She took it on her own to clip half of my big toenail off!!!! By the time I went to stop her, it was too late. Excuse the photo of my monkey toes but I had to share this with you. To say I am P.O'd is putting it very polite. I know this will take months to grow out, which means ugly toes during sandal season. Has anyone ran without a big toenail before? I am a little panicked over this since my toe is very tender to the touch. Should I run with a bandaid on the toe and will that protect it enough? The right top portion of my toenail was left on which is going to make it very frustrating to grow back. Everyone keeps telling me to complain to the owner, well she is the owner. Plus this is the first negative experience we have had at this location. Other than my foot drama, I have a big week of eating delicious foods ahead of me. I will be running 3 miles three times this week proir to our half marathon to keep up with the calories I am going to ingest. Tonight, I am checking out the Spring menu at Pelagia Trattoria my absolute favorite Italian restaurant in Tampa. I am looking forward to seeing what Chef Andrew Basch has in store for this evening. This will be Gabe's first visit to Pelagia! Tomorrow is DishCrawl Cigar City. I am super excited for this as I am a Ybor resident and one of the restaurants I suggested is the restaurant we are starting off with - Instablu Turkish Restaurant. I loved helping Tracy out with finding eats in my favorite city. On Wednesday, Gabe and I are checking out Mangroves dinner menu. I recently had the opportunity to sample some of their brunch offerings and am really looking forward to this! 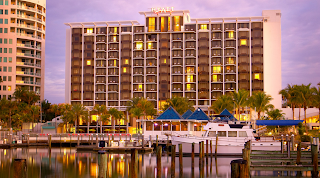 On Friday night, we are checking into Hyatt Sarasota. I have never been to Sarasota before and am really looking forward to checking out this city prior to the Sarasota Half. While in Sarasota, we are dining at Currents and I cannot wait to see what Chef Leo Gianulis' has in store for us. Ironically enough, this Friday is Third Friday Food and Wine Hapy Hour at the Hyatt. On the third Friday of every month, Currents offers unlimited wine and imported cheese and tapas selections for $25! On Saturday night, we will be carb loading at Flavio's in Siesta Key. Flavio's has a great lineup of brick oven pizzas and homemade pasta. I have no idea how I will pick one item! Finally, this Sunday is the big race day. 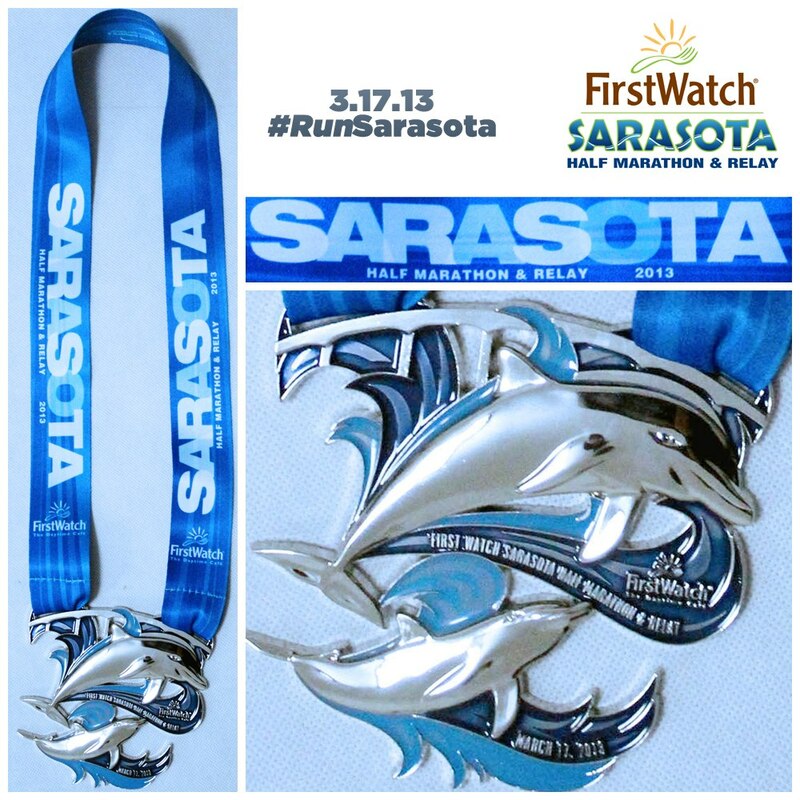 The Sarasota Half looks to be a beautiful course. After the run is over, we will be treated to a breakfast from First Watch, the sponsor of the race. After we get cleaned up and check out of the hotel, we will head to brunch at The Table Creekside. After seeing a sneak peak of The Table's brunch menu, I feel I should change the name of my blog to I run for Brunch - Short Rib Benedict, Venezuelan King Crab Quesadilla, Duck Poached Egg with Nueskes Potato Hash, Kobe beef carpaccio and eggs. I cannot wait! Oh no!!! What a terrible thing for her to do. I lost my big toenail and at first it was very sensitive but now I just run fine with it (its only about 1/4 of the way "new" but that was already growing in when it fell off). Just make sure your sneakers don't rub or hit it. Good luck! Ang - that is great news to hear. 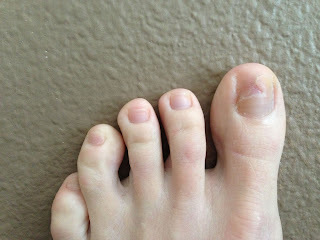 My toe is super sensitive and I hope that it will be fine come Sunday. If not - I will be walking 13.1 miles. It is on St. Patricks day so if that is the case, hopefully there are people with green beer along the course, lol! Your toe will be fine. You can wrap it with some padding on the area where the nail has been removed to prevent bruising. If you have injinji socks they might be helpful in keeping any wrapping on and preventing it from sliding. If not, just use some good athletic tape. As for the spa that did this without your permission, I think you should complain to the BBB. I stopped getting pedicures after I got ingrown toenails a couple of times. They cut away stuff they shouldn't in order for our toes to look pretty, but I'm more concerned about their function! Good luck in your race. I am coveting that medal! Ouch!!! I've run without them, but I've never had anyone PULL them off - that sounds painful! I am not too thrilled over it!! Especially being I have not lost one on my own yet and my first no toenail experience is due to another person. 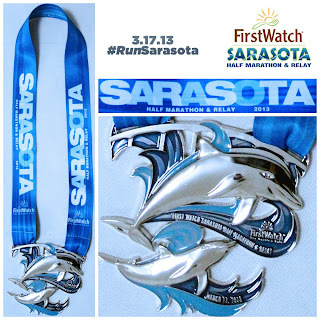 yay for Sarasota half! 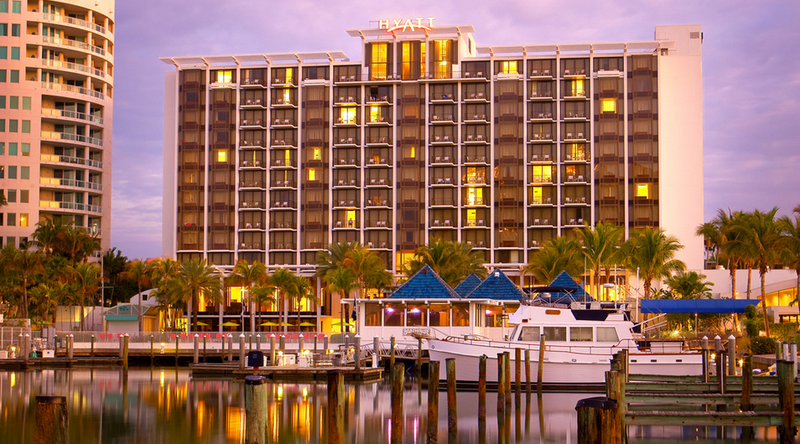 Are you staying at the Hyatt? I was there last weekend and at at Currents. It was pretty good. There was not enough selections for this picky eater :) BUt what I had, I was able to work with. The hotel was very nice! We had the coldest weekend of the year and were hoping for a beach weekend. As for the toenail, I have run sans toenails before, I just never ran without a big toenail. Just keep it clean I am guessing. I found they were sensitive with shoes on, but once I started running, it was fine. Maybe the pressure? Do you have any goals for this race? I cant wait to read all about the places you are trying! sounds so fun! ok, nevermind.. you are staying there! Hey Genna!! Thanks so much for the comment. I am feeling a little better about my toe but still really upset over it. Are you running this one? I am looking forward to staying at the Hyatt. We've never been to Sarasota so this is a new adventure for us and I am mentally making it a mini-vaca. As for goals, right now it is to finish it. We overdid it this year. This is my 5th since December and my BF's 4th along w/ 1 marathon. Too many races in a short period of time. I went medal crazy and now it is affecting me, both mentally and physically. I've loved your food posts! I think most runners are foodies. And some runners run because of food! And, in my mind, New Orleans has some of the best flavors in the world, so that makes sense to me. You are rockin' it with the half-marathons! Congrats!